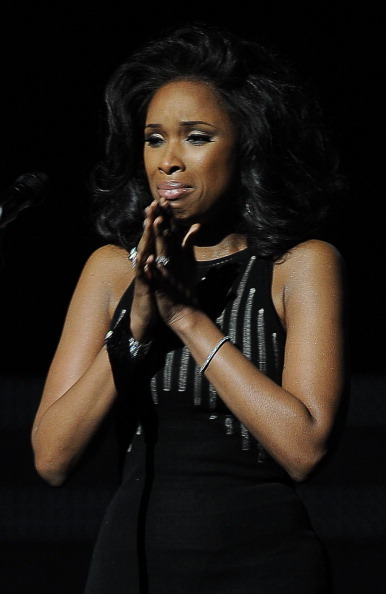 Jennifer Hudson belted a powerful and emotional rendition of Whitney Houston's staple "I'll Always Love You" during a Grammy tribute to music industry professionals who died last year. Following a clip of Houston singing "Saving All My Love For You," the stage lights cast a silhouette of the former "American Idol" that looked strikingly similar to Houston. In a sleeveless, form-fitting black dress, Hudson wore her hair in a poufy, curly 1980s style reminiscent of the late icon. 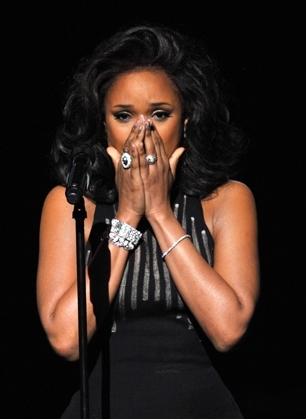 Hudson began the song a capella and quickly received applause for her vocal pacing and ability to capture the mood of Houston's version that appeared on the soundtrack for the 1992 film "The Bodyguard." Hudson fought back tears as she sang the lyrics that pledge unconditional love. Hudson breathed new life into the song that references "bittersweet memories" and promises to "think of you every step of the way." Though Hudson is clearly capable of mimicking Houston's climatic high note at the end of the song's chorus, she tastefully opted not to do so. She sweetly closed the song with a sincere, soft-spoken, "We love you." Alicia Keys, Bonnie Raitt, Stevie Wonder, Rihanna and LL Cool J also acknowledged Houston during their moments on stage. LL immediately addressed the Houston's death during his opening speech. "There is no way around this," he said. "We've had a death in our family." Instead of suggesting a moment of silence, LL felt compelled to pay his respects more personally. "For me, the only thing that feels right begins with a prayer - for a woman who we loved, for our fallen sister, Whitney Houston," he said.